Artist, writer, singer and actor Robert Eugene Smith was born Oct. 14, 1927, in St. Louis, Mo., the only child of Clarence and Mary Agnes (Walls) Smith. He grew up in St. Louis, Union and Garland, Tx. He was forced to drop out of high school to help support his family, and was very proud to have earned his diploma in 1970, at age 42. In 1981, he completed 60 college hours at SMSU and earned a substitute teaching certificate, and later taught occasional art classes. Robert moved to Springfield in 1975, with hopes of acting at Landers Theater. Although he spent time in Columbia, Jefferson City and St. Joseph, Springfield became his home. 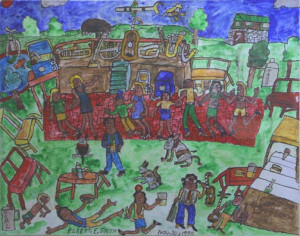 Robert held many jobs, among his favorites, selling concessions at Busch Stadium and selling Grit newspapers, but it was Robert’s artwork that brought him fame and national recognition. 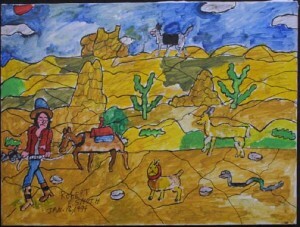 Though he had drawn since childhood, he didn’t take his art seriously until 1967, when he sold his first collection of drawings to a friend for $25. 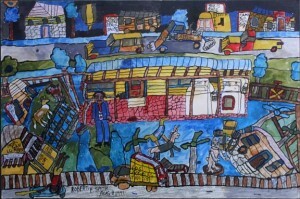 Robert was self-taught, taking inspiration from coloring books, photos, history, news stories and his own experiences. His “story paintings” camecomplete with a hand-written description of the painting and a cassette of Robert himself reading the story. The paintings overflow with color, humor and incident, representing a triumph of the imagination over a strenuous and difficult life. They have been shown at New York’s Museum of American Folk Art, Vanderbilt University, the Springfield Art Museum and sold at distinguished galleries across the country. 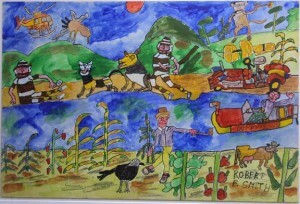 Robert is featured in The Museum of American Folk Art Encyclopedia of Twentieth Century American Folk Art. His paintings are on display in hundreds of Springfield homes and businesses. A mural of his painting of Springfield’s former Colonial Hotel, complete with Elvis Presley and Ray Charles, remains downtown at Campbell and Walnut. Robert was also a prolific writer, producing many self-published volumes of poems and semi-autobiographical stories. Though he didn’t drive, Robert traveled coast to coast by Greyhound Bus and bicycled all around Springfield — once even riding to Branson. He carried a camera everywhere, to record scenes and faces for his paintings. Robert loved life. He loved to sing, anywhere from recording studios to answering machines. He loved to be on stage and on camera, recently appearing in the film “To and From”. He loved to dance with pretty girls. He loved wearing bright colors and costumes, often appearing in a sombrero, wig or clown shoes. 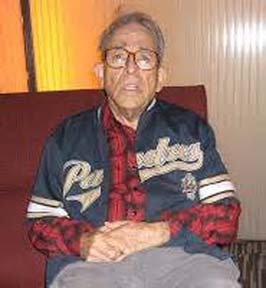 He loved baseball, holidays, parades, Shirley Temple and telling stories. Robert had an incredible memory. He recalled the make and model of every car his family owned, St. Louis Cardinals scores, and the names of girls he danced with when Sinatra and Elvis songs first played the radio. Friends’ birthdays were always marked with a phone call, a song and often, a small painting. He passed away Feb. 13, 2010 at the age of 82. A celebration of Robert’s life was held at the Springfield Art Museum.